Before I mention a few things, here’s a picture of that awesome 9100 ft. mountain in Israel – Mt. 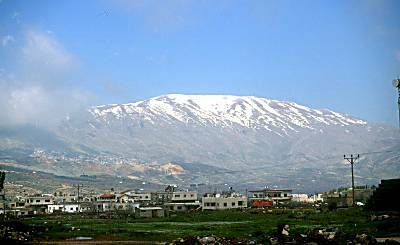 Hermon – actually borders Israel, Lebanon and Syria. Notice how green and lush the land is near the mountain. Recently our body of believers rejoiced when a guy came to Christ. It was SO awesome. His thirst began by one person sharing life with him and the witness of the Word. Then another person spent more hours with him and shared the life of Jesus in a very compelling way. The person that actually led him to Jesus had just met him that night at a gathering we had at a restaurant after our service (we meet on Sunday nights). The final person’s heart was ready and so was this guy’s. God spoke through this last link in the chain and he was ready to accept Jesus’ love and forgiveness. The two of them excused themselves from the table, went outside for a bit, more questions were answered and then the challenge came, “Would like to accept Christ and receive His forgiveness?’ He answered, “Yes”. So, in essence this guy’s heart was made thirsty by believers who exemplified unity, who were drenched with the dew of the Word and this led to him drinking from the eternal fountain of life! What’s your recent testimony of how God used links in the chain and the dew of unity to bring a thirsty world-dweller into God’s family? stankellner.com (c) 2010. All rights reserved. Mountain Dew…more than a soft drink!